وزارت نیروی کشور ایران در حال بررسی تنظیم مبحث 16 مقررات ملی ساختمان‌های شهری است که در آن همه ساختمان‌های مسکونی بیش از چهار طبقه با بیش از ده واحد آپارتمانی ملزم به داشتن مخزن ذخیره آب با گنجایش 12 ساعت مصرف آب می‌باشند. عملی شدن این مقررات در آینده ممکن است اثرات منفی در کیفیت شبکه آب اشامیدنی داشته باشد. در این پژوهش به ارزیابی تأثیر بهره‌برداری نادرست بر خرابی کنتور، تعمیرات اضافی در شبکه توزیع و کیفیت آب شرب مخازن ذخیره نصب شده در داخل ساختمان‌های بلند مرتبه پرداخته شد. برای تحقق بخشیدن به این پژوهش از روش مشاهده میدانی وضعیت سیستم پمپ و مخزن ساختمان استفاده شد. نمونه‌برداری و آنالیزهای کیفی بر اساس کتاب استاندارد متد 2005 صورت پذیرفت و بانک اطلاعاتی امور مشترکان و بهره‌برداری شرکت آب و فاضلاب به‌عنوان منبع آمار مورد استفاده قرار گرفت. آزمون‌های کیفی متداول بر روی 50 مخزن نشان داد که 10 درصد نمونه‌ها دارای بار باکتریایی هتروتروف کمتر از cfu/ml 500 و 8 درصد نمونه‌ها دارای آلودگی کل‌ کلیفرم بود. کدورت بالاتر از NTU 1 در برخی مخازن مشاهده شد. این مقدار کدورت هر چند از نظر استاندارد قابل قبول است، اما به کنترل‌‌های جدی‌تری نیاز دارد. 82/4 درصد مشترکان اقدام به پمپاژ مستقیم کرده بودند که افزایش قابل توجهی در هزینه، خرابی کنتور و افت فشار را در پی داشته است. بررسی کیفیت میکربی مخازن ساختمان‌ها نشان می‌دهد که احتمال آلودگی میکربی در آب شرب مخازن ذخیره خانگی، خرابی کنتور و ایجاد تعمیرات اضافی شبکه آبرسانی به وسیله عوامل انسانی و محیطی وجود دارد. از این رو انجام بازدیدهای دوره‌ای و پیگیری‌های قانونی برای شرکت‌های آب و فاضلاب و ادارات بهداشت امری ضروری است. 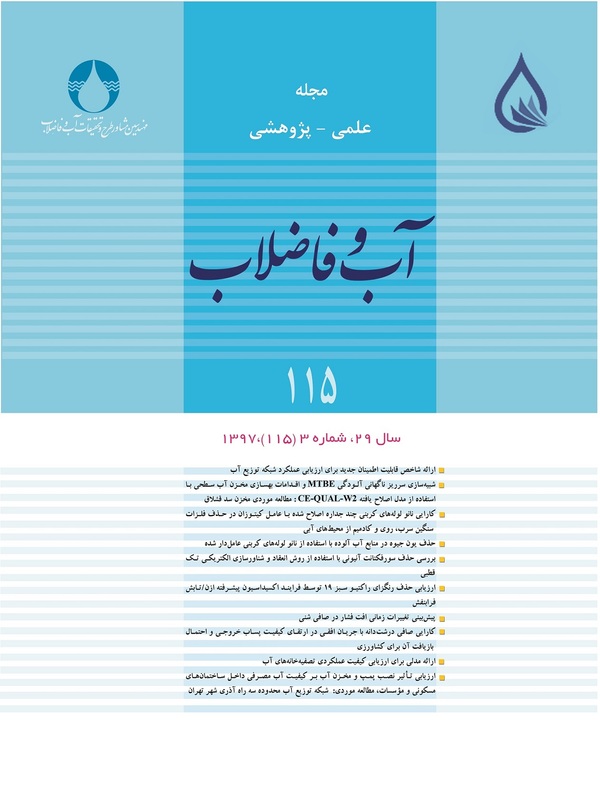 Requirements of the Issue Sixteen of the Iranian National Building Code demand the protection of the drinking water network inside residential buildings over 4 stories or with more than 10 units. These buildings should aslo be supplied by a storage tank with sufficient amout of water supplying for 12 hours of consumption. Without proper regulations, the implementation of this newly building code may create problems including degradation of on-site water quality. To address this problem partially, this research has been undertaken to evaluate the effect of: incorrect operation on water meter failures, extra repairs may be needed in the distribution network, and the quality of drinking water in storage tanks installed in high-rise buildings. To carryout the objective of this study, regular field inspection of pump and reservoir system was performed, during each in each field observation water samples were collected, and all water samples were analyzed according to the methods specified in the 2005 edition of the “Standard Methods for the Examination of Water and Wastewater”. In addition to the analytical data collected from this study, the existing water quality data from Tehran water and wastewater company were also utilized. All together, routine qualitative tests were performed on 50 on-site reservoir tanks in residential high rise buldings. The results of sampls’ water quality showed that: (i) about 10% of the samples had higher level of heterotrophic bacteria with standard deviation of 56%, (ii) 8% of the samples had concerned level of total Coliforms contamination. In addition, the turbidities of higher than1 NTU in some tanks were observed that may be an indicative of an additional water water quality problems. Aside from water quality problem, direct pumping was made by 4.82% of the users in which this activity significantly contributed to an increased energy costs, water meter failures, and water pressure drops. From the preliminary findings of this study, it has been concluded that there is a potential risk for microbial contamination in drinking water storage tanks and there is also potentials for pump and meter failures and as a results additional requirements for regular maintenance. Because the accurance of these problems are inevidable, it is recommended to development a proper regulatory guidance and enforcement by Tehran’s water and wastewater company in order to protect Public Health safety. Bartram, J., Cotruvo, J., Exner, M., Fricker, C. & Glasmacher, A., 2004, "Heterotrophic plate count measurement in drinking water safety management: Report of an Expert Meeting Geneva, 24-25 April 2002", International Journal of Food Microbiology, 92(3), 241-247. Eniola, K.I.T., Obafemi, D.Y., Awe, S.F., Yusuf, I.I., Falaiye, O.A. & Olowe, A.O., 2007, Effects of containers and storage conditions on bacteriological quality of borehole water", Nature and Science, 5(4), 461-477. Kumpel, E., & Nelson, K.L., 2013. "Comparing microbial water quality in an intermittent and continuous piped water supply", Water Research, 47(14), 5176-5188. Momba, M.N. & Notshe, T.L., 2003. "The microbiological quality of groundwater-derived drinking water after long storage in household containers in a rural community of South Africa", Journal of Water Supply: Research and Technology-Aqua, 52(1), 67-77. Nath, K.J., Bloomfield, S.F. & Jones, M., 2006, "Household water storage, handling and point of-use treatment, A review commissioned by IFH", <http://www.ifh-homehygiene.org>. Packiyam, R., Kananan, S., Pachaiyappan, S. & Narayanan, U., 2016, "Effect of storage containers on coliforms in household drinking water", Int. J. Curr. Microbiol. App. Sci, 5(1), 461-477. Saadeh, M., Beck, S. & Ngwenya, K., 2013, Optimal design of water distribution system to minimize risk of water main breaks in western fort wayne, Purdue University Fort Wayne, Indiana University. Samba, C., Baldeh, M., & Tuffour, K., 2016, "Analysis of water pipeline breaks", World Journal of Engineering and Technology, 4(2), 220. Sobsey, M.D. & Water, S., 2002, Managing water in the home: Accelerated health gains from improved water supply, World Health Organization, USA. Stocker, A. & Mosler, H.J., 2015, "Contextual and sociopsychological factors in predicting habitual cleaning of water storage containers in rural Benin", Water Resources Research, 51(4), 2000-2008. Tambekar, D.H., Gulhane, S.R., Jaisingkar, R.S., Wangikar, M.S., Banginwar, Y.S. & Mogarekar, M.R., 2008, "Household water management: A systematic study of bacteriological contamination between source and point-of-use", American-Eurasian Journal of Agricultural & Environmental Sceinces, 3(2), 241-246. Trevett, A.F., Carter, R.C. & Tyrrel, S.F., 2004, "Water quality deterioration: A study of household drinking water quality in rural Honduras", International Journal of Environmental Health Research, 14(4), 273-283.